In keeping with Urban.com.au's continued focus over the last few months on the proliferation of co-working spaces across Melbourne, today we take a look at The Hub - an exclusive recreational building comprising a dedicated co-working space and high-end entertainment facilities across three levels with a rooftop terrace, located within Glenvill's YarraBend master planned development on the banks of the Yarra in Alphington. 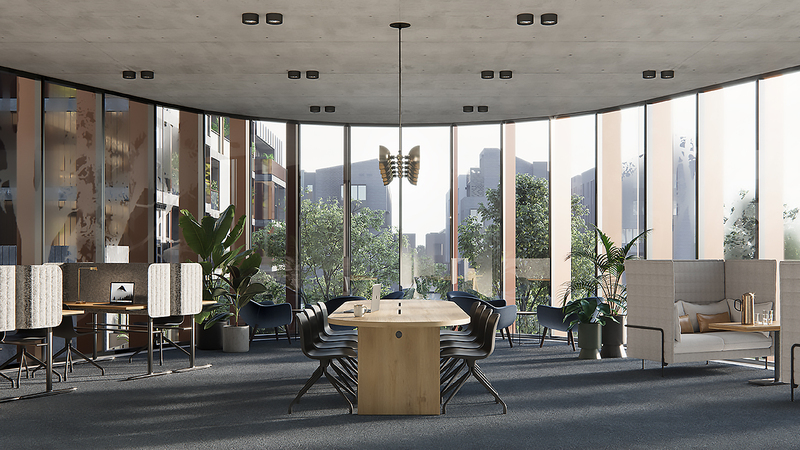 The development of a co-working 'hub' at YarraBend is in response to an increasing number of entrepreneurs seeking collaborative workspaces that foster creativity and networking, along with anyone working flexible hours or from home. The provision of co-working space at YarraBend also reinforces the increasing demand for this type of office environment, and the strength of the Melbourne co-working sector which currently accounts for 50% of all co-working space in Australia. The Hub would join the likes of The Commons in Collingwood and South Melbourne, Dream Factory in Footscray, and the recently profiled CLIK Collective Moorabbin and Hub Australia's Hub Collins Street. CLIK Collective Moorabbin represents 6,000 sqm of co-warehousing and co-working space within Up Property's Morris Moor development in Moorabbin, while Hub Collins Street has a variety of workspaces to cater for up to 600 members including bespoke offices, private offices and open plan dedicated and flexible desks within The Georges Building at 162 Collins Street. Located within The Artisan Precinct, The Hub embodies YarraBend's six visionary pillars including health & wellness, technology, food & entertainment, sustainability, art & design, and knowledge. Technē Architecture + Interior Design have designed The Hub around sound design principles of placemaking and user experience, with its multi-dimensional nature requiring a unique design approach that focused on creating versatility and functionality. The Hub is composed of a selection of natural materials and exposed concrete, which draw on the site’s industrial heritage as a working paper mill. This palette is restrained and considered, responding to adjacent apartment building facades, with profiled vertical fins wrapping the glazed exterior, while internally exposed fittings, fixtures and elements create visual interest within the interiors, with a strong focus on tactility and craftsmanship. According to Director of Sales and Marketing at Glenvill, Ashley Bramich, the 400 sqm building blends together premium recreational facilities with a contemporary work environment complete with all of the mod cons and is a reflection of YarraBend’s commitment to integrating technology, entertainment and considered design throughout the development. The big question we asked ourselves at the beginning of the process was - how do we elevate this unique site? We had to ensure we designed the right product and provided the development with a diversity of product and architecture, while remaining at the forefront of sustainability. The design of The Hub is unique and timeless and aligns strongly with the YarraBend master plan which was developed with a strong focus on placemaking, sustainability and liveability. The Hub responds to growing trends such as working from home and the disruption occurring within the technology space, so it was important to provide a strong level of amenity within the development for residents. A chef-quality kitchen and two expansive dining areas are located on the ground floor, providing residents with the ability and space to host or entertain larger groups of friends and family. The Hub's WorkLab occupies an entire floor and includes a meeting room, desk-spaces and a lounge area complete with all the latest technology. The Hub Lounge is located on the top floor and features a games room, pool table, TV and a bar, providing residents with a comfortable environment within walking distance of their homes. 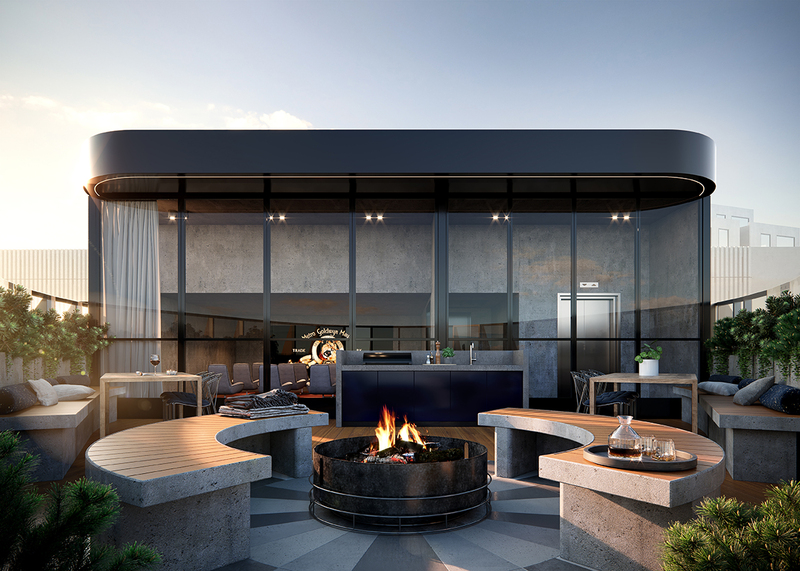 This is supported by the rooftop terrace which includes a barbeque and fire pit. There’s also an indoor cinema encased in glass which along with the dining room and rooftop terrace, will be available to book via a smart phone app which is exclusive to YarraBend residents.